Which storm surge product should I use when? The National Hurricane Center's (NHC) Storm Surge Product Decision Support Wedge offers a three-tiered approach to utilizing available storm surge data for decision support. While hurricane track forecasting continues to improve, the average track error 48 hours prior to landfall for the Atlantic basin is still considerable, now near 100 nautical miles. Moreover, average intensity forecast error 48 hours prior to landfall is 15 kt. These average errors could mean the difference between a Category One hurricane making landfall in Pensacola, Florida, or a Category Three hurricane striking New Orleans, Louisiana. The 24-hour to 48-hour window is often critical for decision-making. It is important not to focus solely on one storm surge product within this window. Storm specific uncertainties are accounted for in the probabilistic storm surge (p-surge) product, while the *MOMs and *MEOWs provide a worst case storm surge estimate at a regional level. The Hurricane Local Statement (HLS), available from the National Weather Service (NWS) Weather Forecast Offices (WFOs) upon the issuance of tropical cyclone watches and warnings, summarizes local impacts (i.e., county or parish level impacts) from storm surge. Consequently, understanding the four available storm surge products and carefully reviewing where each falls within the three-tiered decision support wedge allows decision-makers to make the most informed decisions within current forecast limitations. 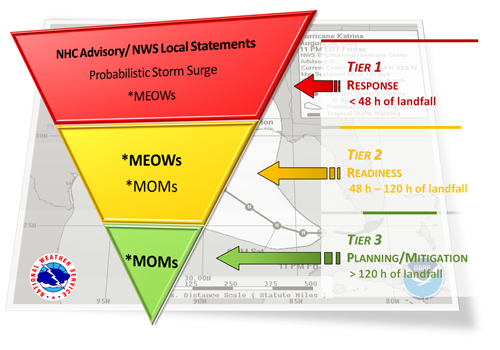 * Provided average errors inherent in NHC intensity forecasts (discussed above) and the sensitivity of storm surge forecasts to storm intensity, it is recommended that emergency managers employ MOMs or MEOWs for a hurricane one category higher than what is forecast by NHC at landfall. This tool is designed as an aid for emergency managers and trained officials only. It is not intended to be used by the general public for making life or death decisions. Closely follow all instructions from local and state emergency management during a hurricane threat. If you are asked to evacuate, you should do so without delay.